Produced in 2014 by Funko, this is part of their ReAction action figure line. 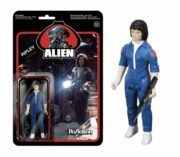 This one features the character of Ripley in a spacesuit from the classic sci-fi horror film Alien. It measure 3.75″ high, comes with a removable helmet and is a sealed, mint on the card figure with the original punchout still attached. Produced in 2014 by Funko, this is part of their ReAction action figure line. 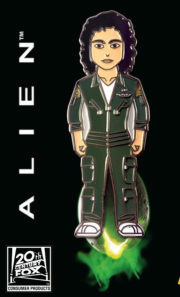 This one features the character of Ripley with a rifle from the classic sci-fi horror film Alien. It measure 3.75″ high, comes with a removable rifle and is a sealed, mint on the card figure with the original punchout still attached. This is a mint, 4 1/4″ per side triangle patch, which is the United Kingdom 700th Anniversary logo, a variation of the British flag. This was seen in the hit movie ‘Alien’ on the uniforms of the ill fated crew of the Nostromo. 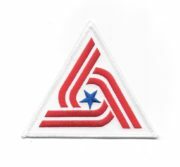 This is a mint, 4.25″ per side triangle patch, which is the American Tricentennial, a variation of the U.S. flag. This was seen in the hit movie ‘Alien’ on the uniforms of the ill fated crew of the Nostromo. This is a mint, 4″ x 3.25″ patch, seen in the hit movie ‘Alien’ on the hats and shoulders of the ill fated crew of the ship of the same name. This a mint, 4″ x 3.25″ patch, seen in the hit movie ‘Alien’ on the hats and shoulders of the officers of the ill fated crew of the ship of the same name. This is a cloth baseball style hat with a mesh back with the Alien Movie U.S.C.S.S. 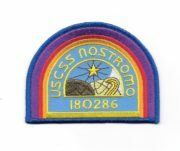 Nostromo Officer logo patch attached to the front. This is a new, never worn hat, available in either blue or black. If you do not choose we will send our choice. 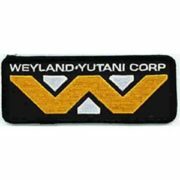 This is a mint, unused 4″ wide patch of the logo of the Weylen-Yutani Corporation as seen in the hit movie `Alien’ and ‘Aliens’. This is the second version which features the “Building Better Worlds” phrase at the bottom. This is the corrupt company than owned the Nostromo and its expedition, and was terraforming the planet in the second movie. This is a mint, unused 3 1/2″ wide patch of the logo of the Weylen-Yutani Corporation as seen in the hit movie `Alien’ and ‘Aliens’. This is a cloth baseball style hat with a mesh back with the Alien Movie Weyland-Yutani Corporation logo embroidered patch attached to the front. This is a new, never worn hat, available in either blue or black. Let us know which color you prefer or we will choose black. It has been stored in a smoke and pet free environment. This is a mint 4.5″ long blue wing patch as seen in the hit movie ‘Alien’ on the uniforms of the ill fated crew of the Nostromo. It is one of the logos for the Wyland-Yutani Corporation. 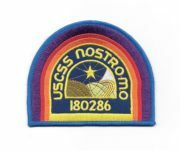 This is a mint 3″ long wing patch as seen in the hit movie ‘Alien’ on the uniforms of the ill fated crew of the Nostromo. This is part of the FUNKO line of POP! vinyl figures and this series features characters from horror movies, measuring 3.75″ high. This figure is of an 8-Bit version Alien Xenomorph creature. It comes in a sealed illustrated box with a clear plastic front that displays the toy and it is stored in a smoke and pet free environment. 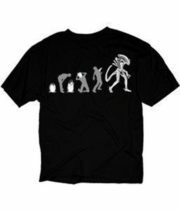 This is a black t-shirt showing the evolution of an alien from egg to adult in a handy chart from the Alien movie franchise. This is a new, unworn 100% cotton pre-shrunk shirt, kept in a smoke and pet free environment. 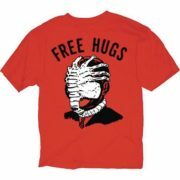 This is a red t-shirt showing the art image an alien face hugger on a human face with the words FREE HUGS from the Alien movie franchise. This is a new, unworn 100% cotton pre-shrunk shirt, available from us in sizes small, medium, large, extra-large, and 2xl. You may choose the size you desire, otherwise we will send size xl. This is a black t-shirt showing a montage of ten alien skulls, all dripping acid from the popular Alien movie franchise. This is a new, unworn 100% cotton pre-shrunk shirt. 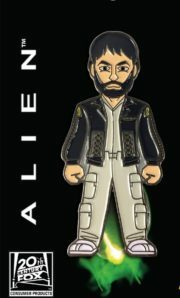 This is a mint, unused licensed metal enamel lapel pin that features a 2″ tall image of Bishop from the Aliens movie. It comes in a sealed package with a header card and it is stored in a smoke and pet free environment. 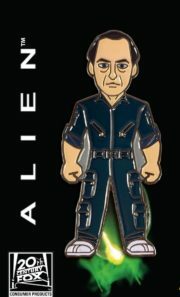 This is a mint, unused licensed metal enamel lapel pin that features a 2″ tall image of Dallas from the first Alien movie. 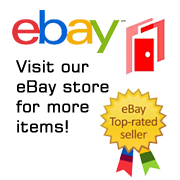 It comes in a sealed package with a header card and it is stored in a smoke and pet free environment. 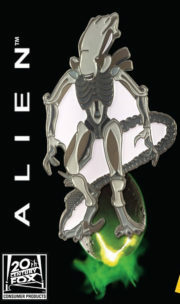 This is a mint, unused licensed metal enamel lapel pin that features a 2″ tall image of Ripley from the Alien movies. It comes in a sealed package with a header card and it is stored in a smoke and pet free environment. 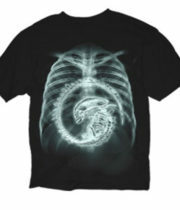 This is a black t-shirt with the x-ray of a human being’s stomach showing the Alien curled up inside from the Alien movie franchise. This is a new, unworn 100% cotton pre-shrunk shirt. It is stored in a smoke and pet free environment. 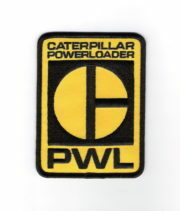 This is the logo patch worn by the operators of the caterpillar powerloaders on the ship Sulaco in the hit movies Aliens. Ripley operated of of them at the beginning and at the end of the movie fighting the queen. This is a cloth baseball style hat with a mesh back with the Aliens Movie Colonial Marines Drop Ship logo patch attached to the front. This is a new, never worn hat, available in either blue or black. If you do not choose we will send our choice. This new, mint 3 1/2″ circular patch, seen briefly on the Colonial Marines, and on the side of their dropship, in the hit movie ‘Aliens’. 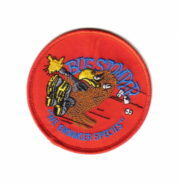 This patch was issued much later than the others in the series and so did not get as much distribution.